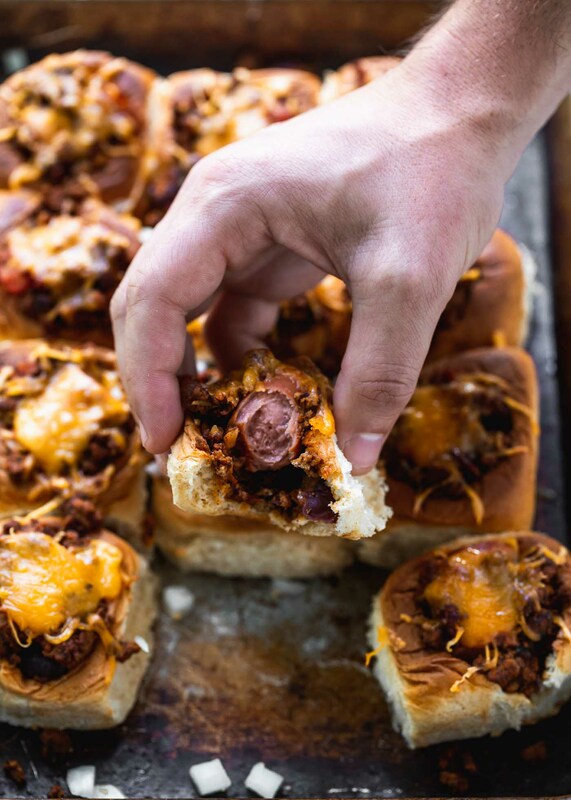 The classic combination of a chili cheese dog gets a bite-sized update in these Mini Chili Cheese Dogs. They’re the perfect Game Day snack! Prior to marrying/dating my husband, I never in a million years thought I’d utter the words Chili Cheese Dog as a legit meal choice. Hot dogs smothered in ketchup and mustard on hot summer days and at ball games, yes. Hearty chili in the dead of winter smothered with cheese, saltine crackers, and fresh onion, yes yes yes. But not the two together. I mean, I get that the Chili Cheese Dog isn’t a revolutionary mashup, it’s been around for decades upon decades, but it just wasn’t my cup of tea. Because when you actually try a chili cheese dog instead of scoffing at the overindulgent lunacy of it, you discover the simple facts – they’re freaking delicious. Again, while these aren’t anything new in the realm of football food, I’ve decided to take the classic combination and turn it into bite-sized Game Day grub that’s impossible to resist. 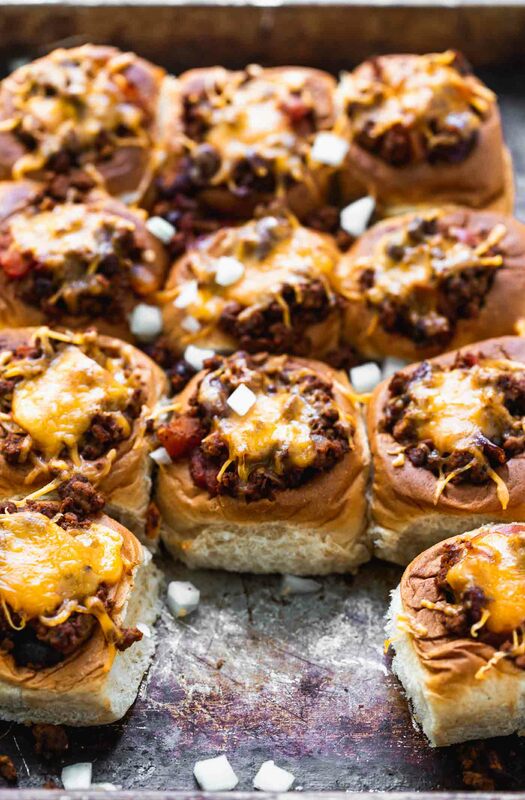 Here’s the gist: Hawaiian rolls are hollowed out, filled with a quick homemade chili, a quarter of a hot dog, more chili, and then sprinkled with cheese. They’re popped into the oven just until the cheese melts, and the hot dog is hot all the way through. They come out soft, gooey, messy, and oh-so delicious. Super simple, yet oddly, a hundred times more satisfying and fun to eat than a regular chili cheese dog. Is it necessary to make homemade chili? You could absolutely buy store-bought chili to make these even easier to put together, but homemade chili is insanely easy to make, and probably a heck of a lot better than anything you can find pre-packaged, so I really recommend making your own. I basically took my favorite simple chili recipe, and cut back on the liquids so it was more in line with a sturdy filling versus a soup-like consistency. Ground beef, kidney beans and plenty of onion make up the base, while tomato paste, diced (canned) tomatoes, chili powder and salt help in the flavor department. I also added just a touch of water to make sure the filling didn’t get too dry while baking, essential in the perfect chili cheese dog. 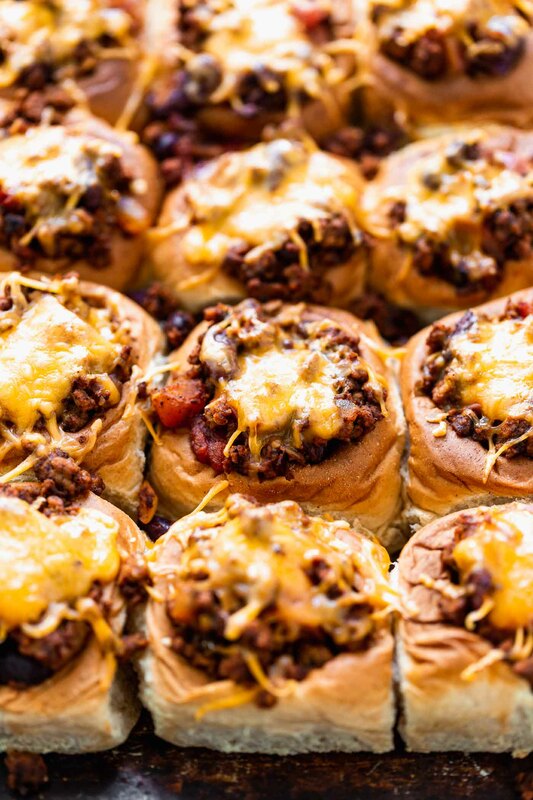 As I was brainstorming possible vessels for the mini chili cheese dogs, my mind automatically gravitated towards homemade mini hot dog buns, which I then seriously contemplated for about five seconds before I came to my senses, and went with my second gut instinct – Hawaiian rolls. These guys are having their moment in the last few years, and I’m totally on board. I’ve stuffed them with a chopped cheeseburger filling, served them tex-mex breakfast style with eggs and chorizo, and I’ve done preparations similar to today, except instead of hot dogs, I stuffed them to the brim with meatballs, covered the meatballs in marinara and then slathered them both with cheese. 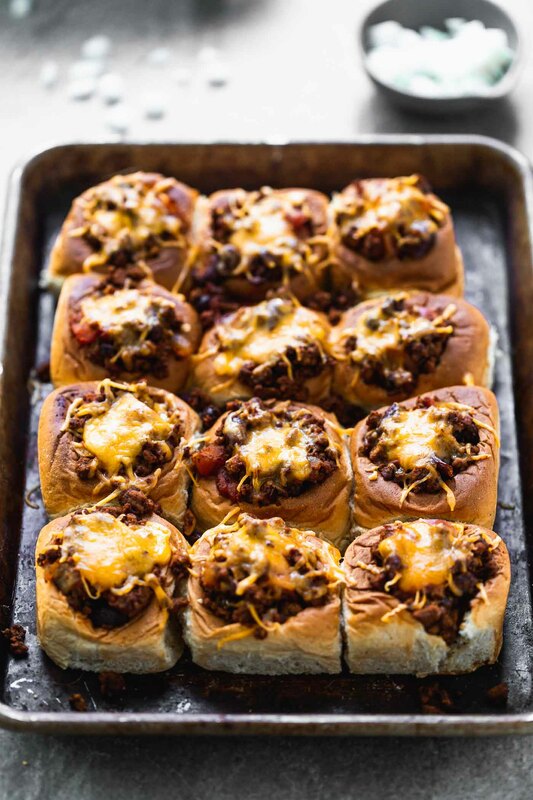 Using them isn’t necessary, you could also use plain dinner rolls, or even a crusty ciabatta or sourdough roll, but I happen to think the sweet, soft Hawaiian roll goes perfectly with the makings of a chili cheese dog. As for toppings, in this particular batch, I went the simple route with a little bit of diced onion, but I think Kevin just ate them as is. Other lovely options would be diced, pickled jalapeños, chopped tomatoes, or even crumbled up saltine crackers. Once they’re done baking, slide them on to a platter, set up the topping on the side, and watch them disappear! 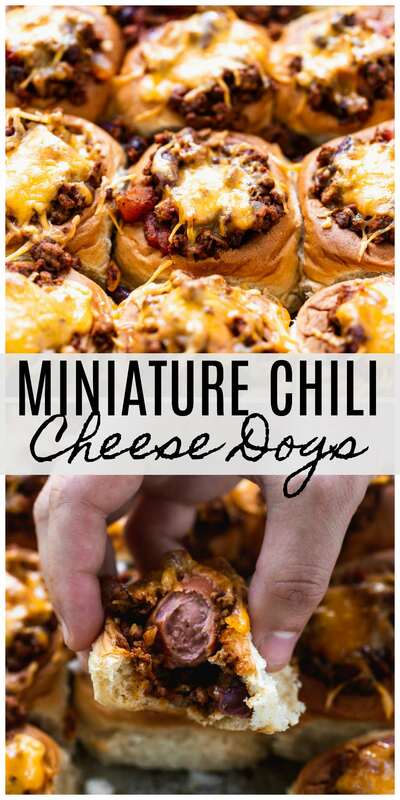 The classic combination of a chili cheese dog gets a bite-sized update in these Mini Chili Cheese Dogs. They're the perfect Game Day snack! Preheat oven to 350 degrees. Grease a baking sheet with non-stick cooking spray. Heat a medium non-stick skillet to a medium heat. Add sirloin and onion. Break up meat with a wooden spoon and cook until beef is browned and cooked all the way through, and the onions are translucent. Add garlic, cook 1 more minute. Add tomato paste, cook another minute. Add kidney beans, tomatoes, salt, garlic powder, chili powder and water. Bring to a simmer, cook until the flavors have melded to together, and the mixture resemble a thick chili, about 3-4 minutes. While the chili simmers, cut a hole in each of the Hawaiian rolls and scoop out the inside. Be sure to leave enough of the rolls to hold the chili and hot dog. Place the rolls on prepared baking sheet. 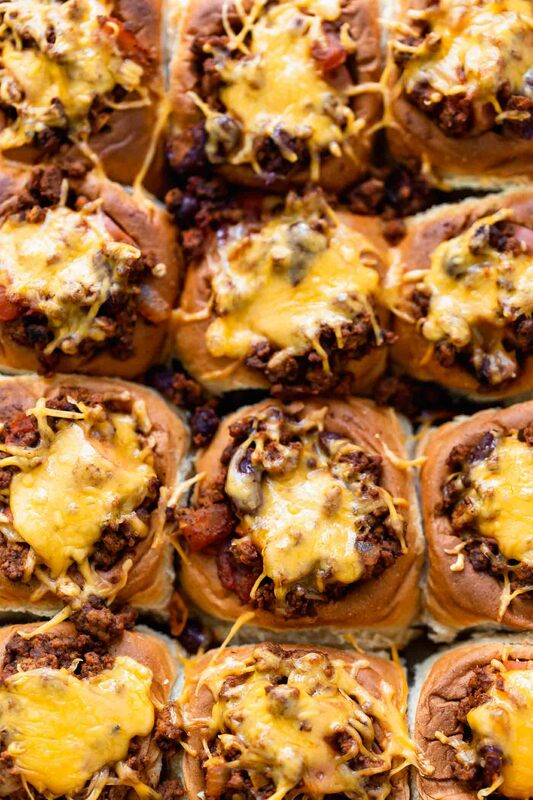 Place a heaping teaspoon of the chili in each hole of the rolls. Lay a hot dog on top horizontally. Spoon remaining chili on top of hot dogs. Sprinkle with cheese. Bake until cheese has melted and hot dogs are hot all the way though, about 8-10 minutes. Serve with chopped onion, jalapeño and any other desired toppings. 2 Responses to "Mini Chili Cheese Dogs"
Fabulous idea!! Can’t wait to make!!! You are so creative; I’m making these.